Van-Tech will be selling a huge selection of products for VW T4, T5 and T6 including Alloy Wheels, Side Bars, Roof Rails, Lights, Curtains, Alloy Wheels, Chrome Accessories and much more!!! Across not 2 but 3 days camping over the bank holiday weekend! Camping for Wonderland opens at 10am on the Friday morning with access to the event from 12 noon, Gates will close at 8pm for entrance into the event, if your are turning up later than 8pm there will be a holding area for you to camp overnight, you will be able to move to your designated area once the gates open to Campers again at 10am on Saturday morning. Come join us for a great weekend of entertainment and fun for the whole family. So, whats in store for you at Dubs in wonderland? As it’s Easter we thought we’d do something for the kids, on the Sunday there will be an egg hunt, so come prepared with the little ones to go in search of goodies. 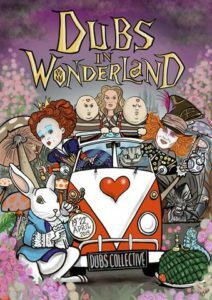 The theme for the weekend is wonderland, so lets see some amazing costumes on the Sunday for the fancy dress parade.